After my November trip to the Lake District, the weather seemed to get worse by the day. Shortly afterwards, my brother and his family were almost cut off by flooding, and that was before the really serious rainfall arrived at the start of December. Still, I was up there again in January. So early in the year, it was hard to gauge the effect on visitors, but don’t be deterred by what you may have seen on TV. The closure of the main A591 between Keswick and Grasmere is both spectacular and devastating, and from a visitor’s viewpoint it means you can’t easily get between the Southern/Central Lakes and those in the North. So you choose one side or the other. At a more mundane level, the damage is more subtle and inconvenient than you may think. So for instance, one location above Lodore Falls was unreachable because the footbridge was in a dangerous state, or Watendlath Bridge is spoiled by scaffolding and a temporary crossing. The flooding hit both of Keswick’s supermarkets, but as I say, that is inconvenient to the visitor and is little trouble compared to those faced by the poor people whose houses were flooded. That area of Keswick is dark at night, and some debris is piled up, but most places are open and they deserve support – so have that third pint you weren’t going to order! This picture was taken on my second day when I was looking in the other direction and hoping for a sunset to catch the snow on Skiddaw. 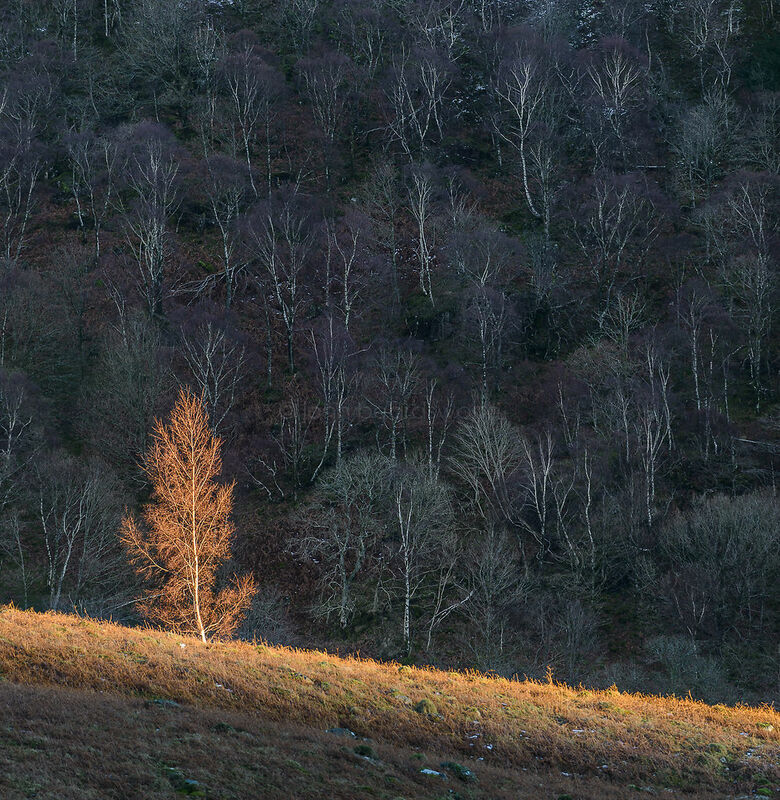 Looking around, I had noticed a line of birches in full sunlight and they contrasted nicely with those on the steep Grange Fell behind, but it was only once I saw how the shadow was moving up the slope that I started shooting pictures. If I had been in any doubt about a trip in January, it was gone in those moments. And if you’re thinking of a trip, the Lakes are open for business. The fells haven’t been washed away, and the lakes are certainly not running dry.